The Department for Transport have today (2nd July) responded to a report on HS2 produced by the Lords Economic Affairs Committee in March. The ‘Economics of HS2’ report had concluded that the Government has failed to make a convincing case on HS2, stating that Government set two main objectives for HS2: increasing capacity and rebalancing the economy, and a convincing case has not been made for either of these. Predictably, as has happened with every Parliamentary report which has raised concerns about HS2, the DfT have dismissed all the points made by the Lords. More of a surprise is that the Government response ‘forgot’ what happened to the Trans-Pennine electrification project last week, claiming “We are doing this now”. In response to the consistent international evidence which shows HS2 would benefit London at the expense of the rest of the country, the Government simply pointed to support from Northern and Midland politicians and a report from KPMG which was dismissed as ‘essentially made up’ by top economists. The fact the costs of HS2 are still expressed in 2011 prices has been of concern to many observers, and following a recent Freedom of Information Request from Chiltern Councillor Seb Berry for an updated figure in 2015 prices, he was told by HS2 Ltd that “We do not hold this information” and by the DfT that there is “no business need to estimate the cost of HS2 in 2015 prices”. This statement highlights the issue the Lords were trying to make. They had said the Government should be clear if £50bn is the absolute limit for the cost of HS2, or whether this will increase with inflation. 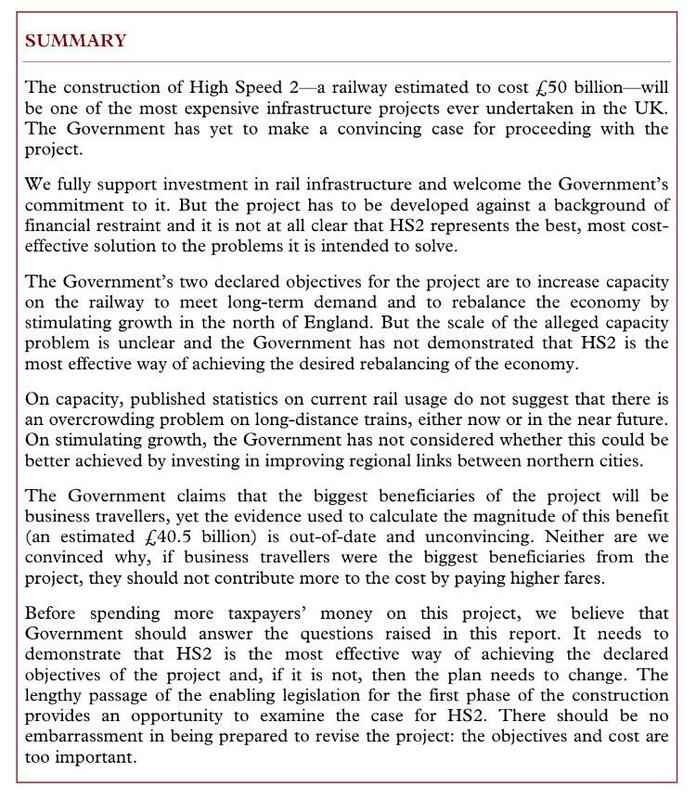 HS2 Ltd saying the method used to calculate their costs is consistent with other major infrastructure projects, which have gone massively over budget is far from reassuring, especially in the context of the recent Network Rail debacle. A summary of findings from the Lords Economic Affairs Committee on HS2. This point is disingenuous to say the least, as response admits that since then, London Midland have increased the number of trains they run on fast lines, and the most overcrowded train in the country in the quoted statistics was the London Midland 16.46 service from Euston to Crewe. The reason for overcrowding on that service was that it comprised of just 4 carriages, which were extended to 8 carriages in December 2013. This means that service should no longer be overcrowded at all, and it could be extended to 12 carriages like many other London Midland services, which is clearly a much cheaper and simpler way of addressing capacity issues. In respect to alternatives to HS2, the Lords EAC said that: “These options have not been assessed equally, with only HS2 receiving serious consideration by the Government.”. The Government responded by referencing the reports the Lords had considered as part of their inquiry, and made statements which have been thoroughly tarnished, such as the idea that upgrading the existing network would mean the “equivalent of 14 years of weekend closures”, despite the fact Great Western electrification is being done mainly overnight. This again, seems rather a hollow sentiment in the context of the need to ‘pause’ projects which had been subject to the same ‘world class’ appraisal techniques. Higgins looked at the original plans to reduce costs, he could not find any savings, so the possible libnks to Heathrow and HS1, which might have made the project even half sensible, were cancelled, or should one say “paused”. Does the Govt. or DfT know the cost at 2015 prices, the public deserve to be told. The way Cameron/Osborne/McLoughlin go on, you would think it was their money they are spending and therefore no need to tell us. It remains risible. “A clear funding envelope of £50.1bn at 2011 prices…strong controls to ensure we remain within our budgets..?” What does that mean, only that they can ignore any subsequent cost increases saying “it’s not our fault, it’s inflation!” Cameron & Osborne are desperate for some reason to force HS2 through, maybe the contracts have already been signed with the Chinese? Everyone should remember that if it’s built, the Birmingham link is scheduled to start in 2027, meanwhile, McLoughlin is “pausing” work needed now, but has forgotten to tell DfT! In most countries, even Germany, expansion of HS lines at best is being curtailed, as Frank Dobson said in the last debate, HS2 remains a “ludicrous idea”. As you no doubt remember, that ’50bn. at 2011 prices’ included 10bn. ‘contingency’ money added by the Treasury, to the original 32bn. which itself was supposed to include for a likely cost overun, and which still remains the basic price, subject to plus or minus element as the design is modified as it is developed. Whether this still represents true cost remains to be seen, but constantly adding additional sums in speculation, from the sidelines,is unlikely to influence the Government, although it may encourage campaigners as they continue efforts to stop the project with alarming projections. This is in fact to follow the advice of Bill Cash back at the Stafford Convention, but so far it seems to have fallen on deaf ears as the plans advance.